CECHCxx - Model C - console in Australia / New Zealand, U.K. / Ireland, Europe / Middle East / Africa and Russia / India. This model 60gb PS3 should not be confused with the NA and JP territories' original "60gb" system. This launch console did not have full PS2 compatibility. Rather, it was the first of a line of PS3 consoles to have partial compatibility via a combination of the PS2's "Graphics Synthesizer" GPU and software-driven emulation. 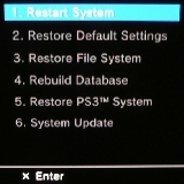 The lack of the PS2's original "Emotion Engine" CPU limited PS2 compatibility to less than 90% of the system's library. This being the launch model for the entire market, Europe never actually received a fully-PS2-compatible unit. In terms of hardware, this partial-compatible console is closely related to the partially-compatible 80gb that came after, but this retains the memory card slots and additional USB ports of the original. BACKWARDS COMPATIBLE - Partial backwards compatibility acheived through use of PS2 Graphics Synthesizer GPU and software. USB - The front of the CECHC console has four USB 2.0 compatible ports. First PS3 released with PS2 compatibility based on software.